It has been more than a year since my last visit to Le Binchotan and the French-Japanese restaurant has come a long way since. 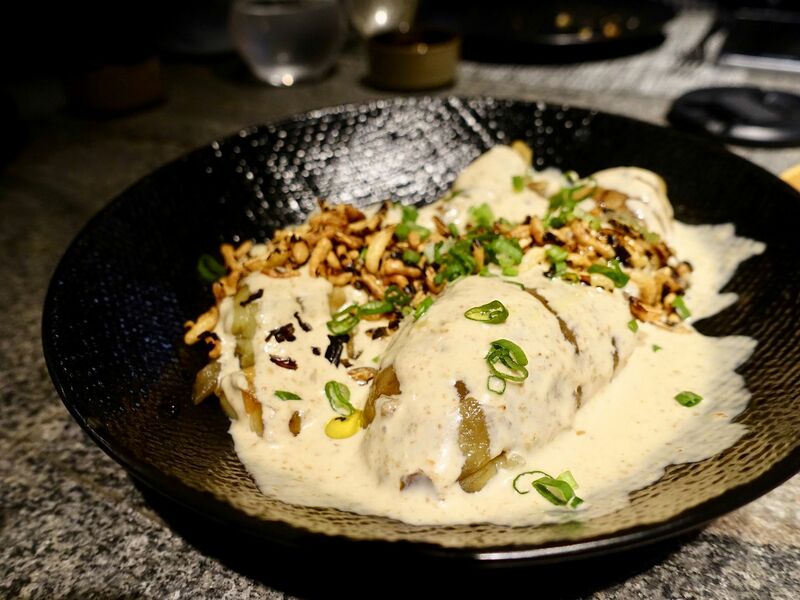 Chef Jeremmy Chiam has taken over the reigns as Chef-Owner, the style is more restaurant than izakaya now, and the dishes are cooked with more finesse. 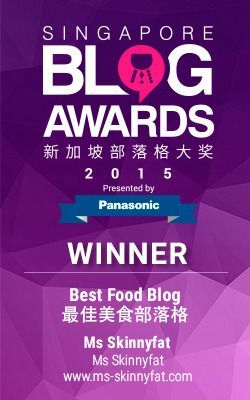 The focus is still on using French and Japanese ingredients and techniques, with a surprising touch of binchotan character and taste in each dish. Take the Uni & Caviar ($25) for instance. 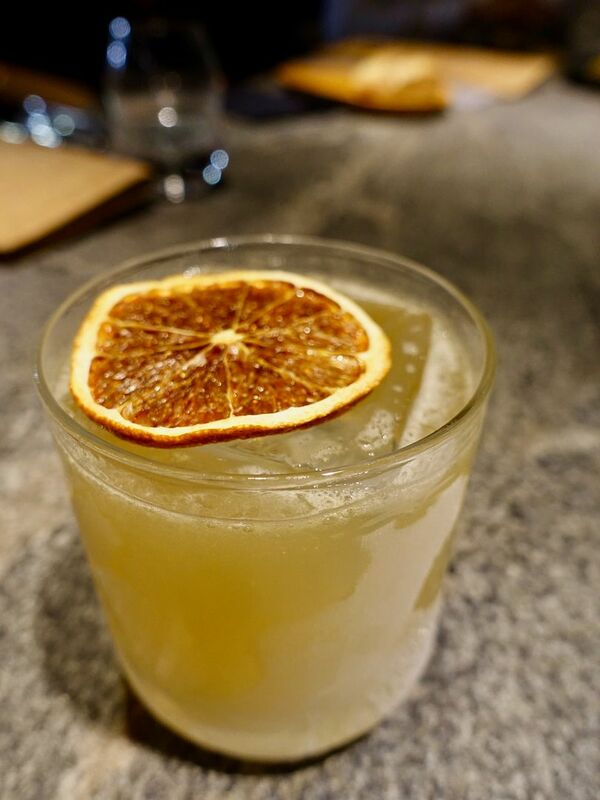 At first look and taste , you wonder where the binchotan is featured. Well, it's in hidden the cold corn mousse- some charred corn kernels suspended in the smooth sweet cream for contrast. 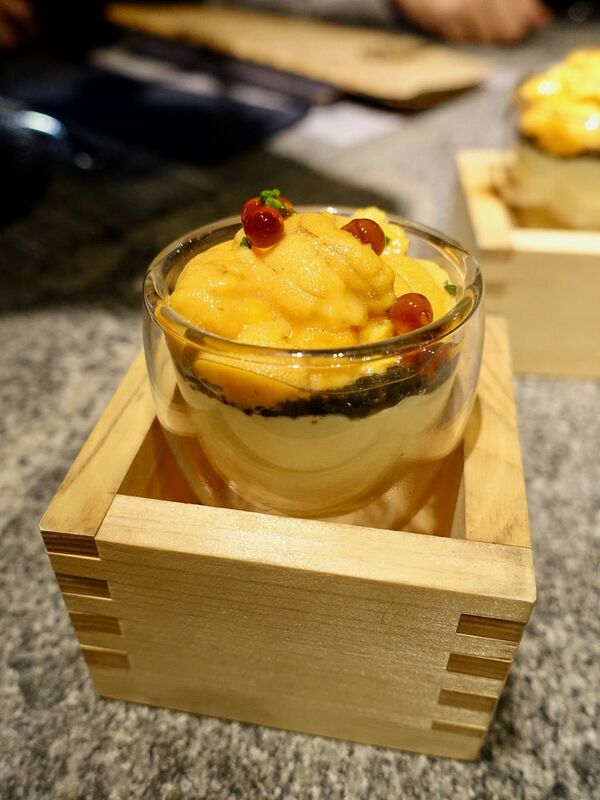 Dig into the briny and sweet wild-caught bafun uni and sturgeon caviar. Note that the spheres are not ikura but shoyu for that added flavor. This is one uni-corn combination that you cannot afford to miss out on! Judging by the name- Binchotan Burnt Aubergine ($12), i was expecting a charred eggplant to appear on my plate but all that char was removed, leaving only the slippery flesh. The meat was served cold with yogurt and a lightly spiced sesame dressing (more fragrant than spicy). If you're into eggplant, this is a good appetizer to get your stomach juices flowing. 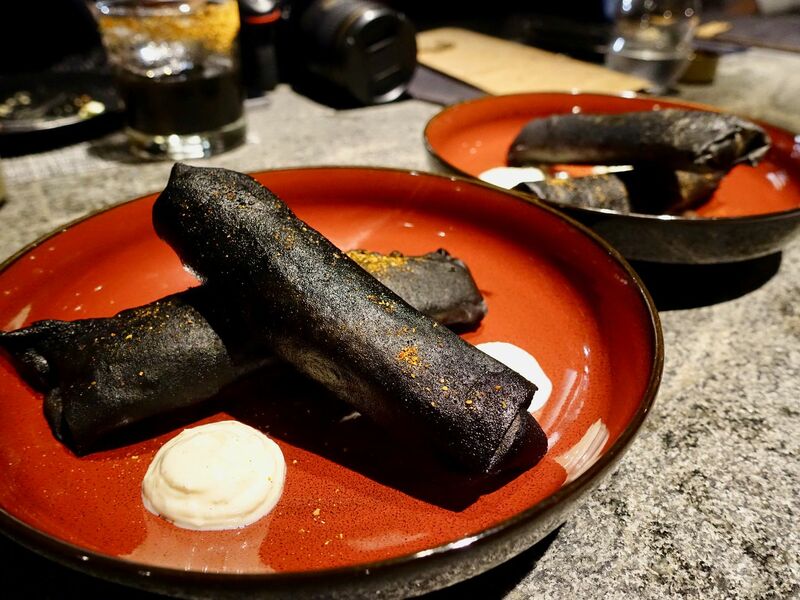 Then we thought Chef was just gonna serve us charcoal. 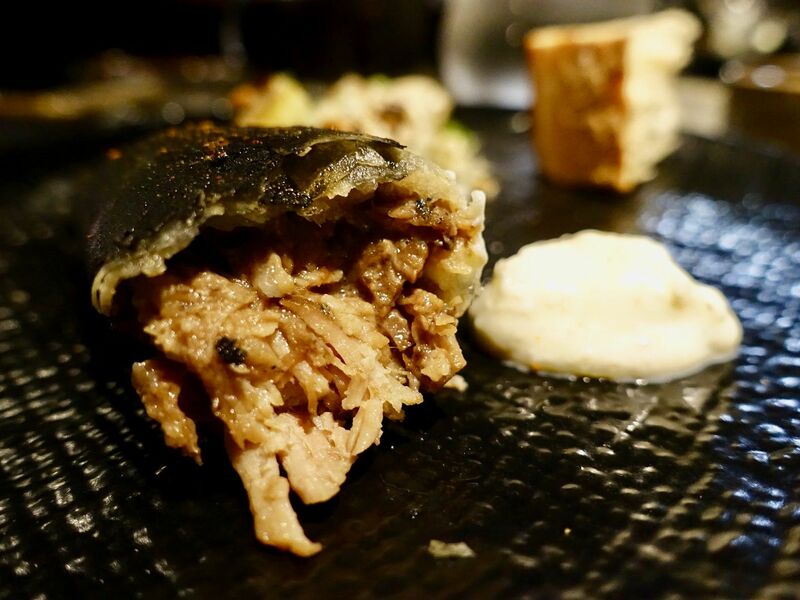 His Edible Charcoal ($23) is a sweet juicy Angus short ribs fried popiah (spring roll). The black appearance is created by rolling the popiah skin in powdered bamboo charcoal. I love the richness of the filling. You may wish to cut through the heavy flavors with the pungent garlic yogurt but i swear you'd enjoy the fried roll simply on its own. The Little Neck Clams ($20) in a Vichyssoise and clam-sake broth was fishy, bitter, but sweet on first taste. I didn't quite like it at the start but the flavor grows on you. I guess part of the fishiness comes from the plump clams (i seldom see such large ones). Well, i'll probably skip this next time still. The Braised Beef Cheek (special lunch main) is worth a trip to Le Binchotan during lunch. 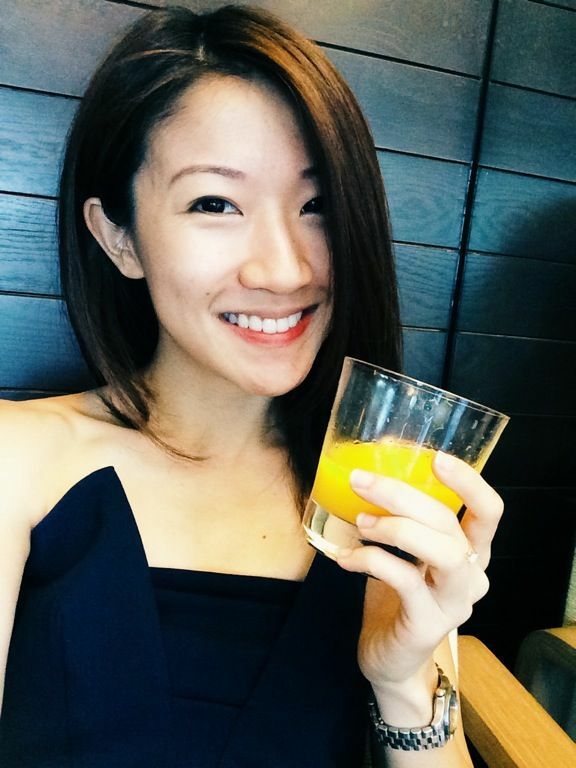 Their weekday lunch menu starts from $27 for a 2 course. 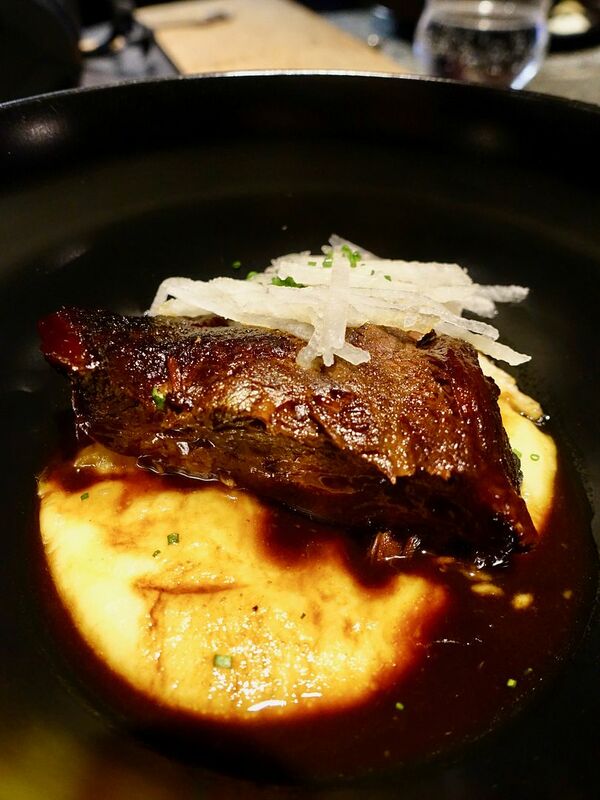 The Australian beef cheeks are braised in Japanese shoyu and molasses sugar until fork tender, and served with vichyssoise and nashi pear. 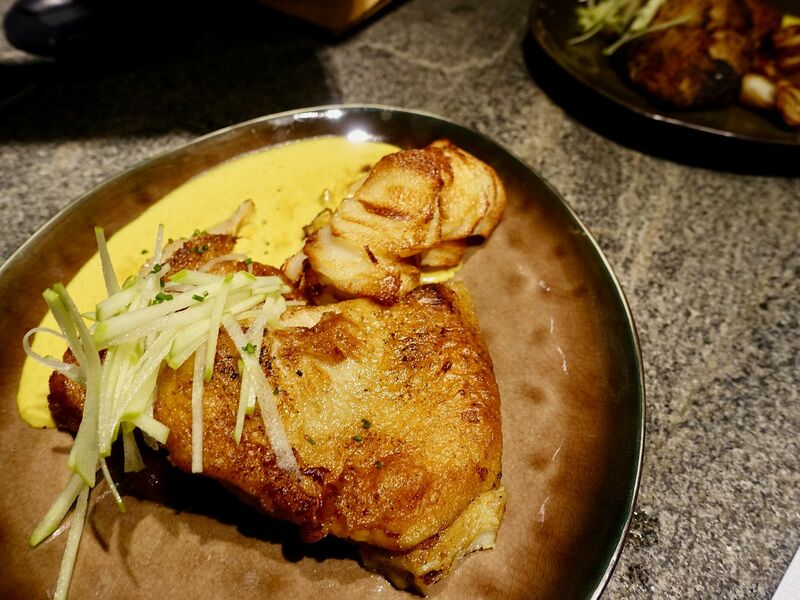 The rich sauce is almost char siew like and would do well with a bowl of rice. Needless to say, i devoured the entire piece. The Char-Pork Jowl ($35) was something that i had before, and wasn't impressed with. Well, the dish has been given a new lease of life. There's more curry flavor in it now and a light sweetness from the mashed green apples that's added to the sauce. A side of thinly sliced Nagaimo (baked and then fried burdock root) was a lighter and better replacement for potatoes. 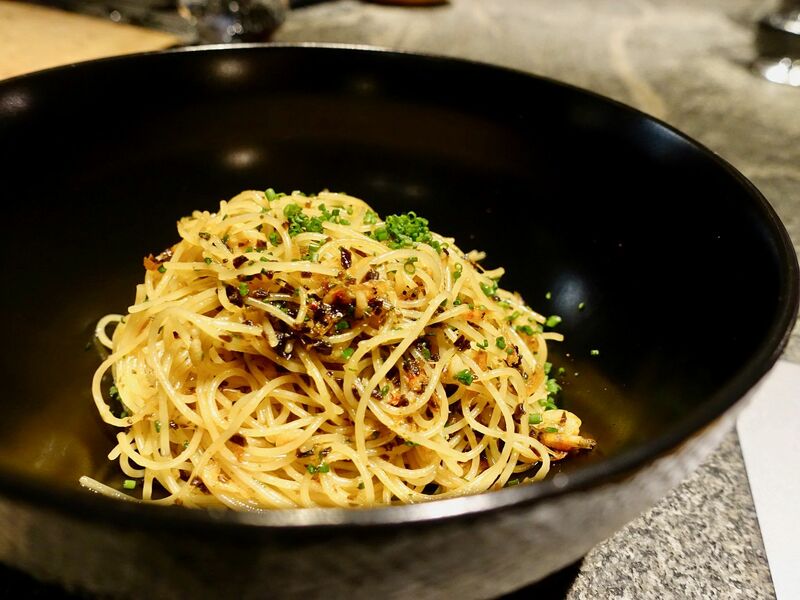 Another must order at Le Binchotan is the Sakura Ebi Capellini ($27) tossed in shio konbu and Sakura ebi. Sounds simple but the flavors were robust and umami. Definitely something to try at home next time! P.S. Recipe as follows: Sauté sakura ebi in olive oil, then add shio kombu with a dash of minced garlic. Once it's quickly cooked together, mix the capellini in, and then finish off with butter and chives. 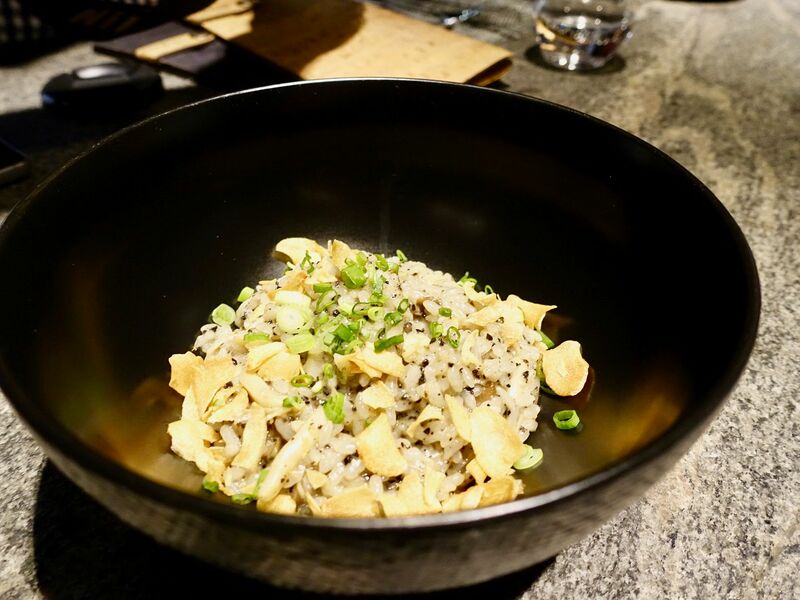 Rice fans can go with the Mushroom Risotto ($29) made from Akitakomachi rice. The rice was creamy even though no cream was used. Enoki and shimeiji mushrooms are sauteed at high heat before both truffle jus and truffle paste are added. Once the resulting mix is reduced, the heat is lowered, then the rice is added in to absorb all the liquid. This also releases the starch to create the creamy consistency in the risotto. Of course, a finishing touch of butter and truffle oil completes the dish. For sweets, the Smoked Chocolate ($15) embodies the flavors of Le Binchotan. The peaty flavor is created by cold-smoking the 64% dark Valrhona chocolate with apple wood. This would certainly go down well with a whisky. The Yogurt sherbet and blueberries were refreshing contrasts to the dark chocolate. Chef made the Matcha Lover ($17) for his lover who loves matcha. 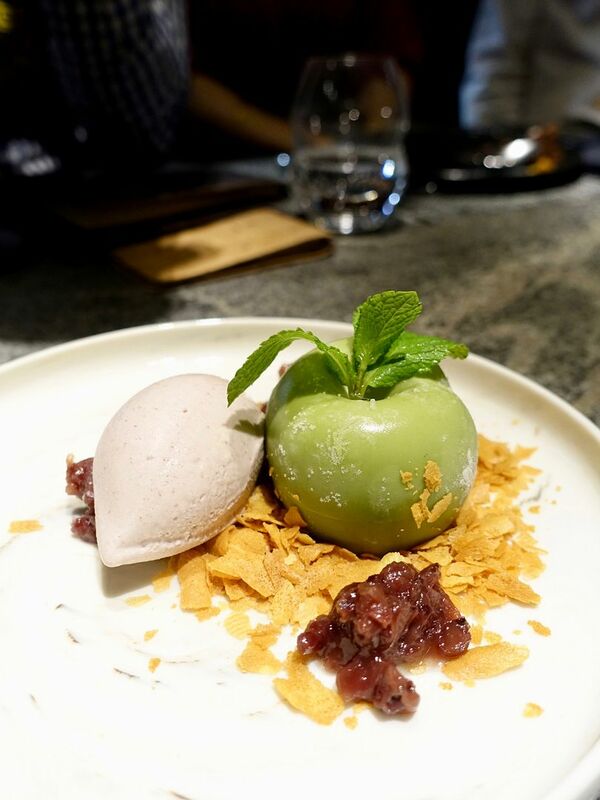 The sticky chewy matcha-white chocolate semifreddo 'apple' holds some frozen azuki paste at its core and the azuki makes its appearance in the ice cream as well. Matcha lovers would be delighted with this. On the drinks front, expect top-notch wines, sakes and cocktails, including for pairing. All the selections are curated by Chef Jeremmy and include boutique high-quality labels such as Grace Wine from Japan and the family-run French labels Château Martinon and Château de la Font du Loup. A few of the vintages such as Château Julia 2014 and Rocche Costamagna Barolo Rocche Dell’Annuziata 2013 are exclusive to Le Binchotan.